Game of Thrones star Iain Glen ditches his sword and becomes a detective in new TV drama. ACTOR Iain Glen’s done it all…but the star of new crime drama Jack Taylor says he has finally tracked down his dream role. FEW people would argue TV needs another detective, but Iain Glen believes there is room for private investigator Jack Taylor. There is the character himself for a start – a roguish alcoholic who seeks justice for lost causes – then there are the acclaimed books by author Ken Bruen, which form the basis of the new series of five feature-length films, not to mention the Galway setting that provides a ruggedly beautiful backdrop. All of the above helped make a case for the Edinburgh-born actor but the chance to doff his cap to 1970s film Chinatown was also too good to miss. He said: “I’ve always fancied playing a private eye, ever since I saw Jack Nicholson play Jake Gittes in Chinatown. “It is familiar territory but I think there are various aspects that individualise it. “One is Ireland’s west coast, which has a stunning coastline, and the town of Galway itself. We are using the locations Ken Bruen uses in his novel series as much as possible. 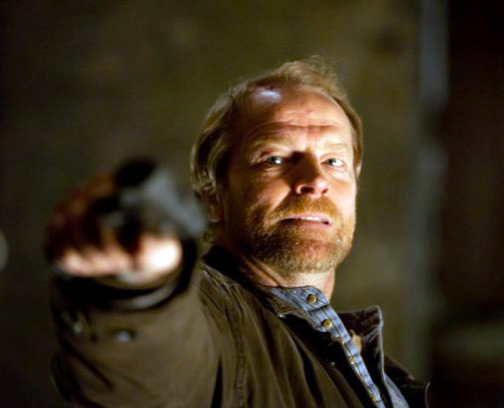 “Jack Taylor is the rogue central character who sets up as a private eye when he is kicked out of the police force. He has a burning sense of justice and wants to investigate and pursue crime that others in positions of power are not willing to do. Not that it is an easy ride. As befits a maverick gumshoe, Jack Taylor has issues. Lots of them. He’s bloody minded and he’s a boozer. He has an attitude, which gets him beaten up, and a soft heart that compels him to defend the lost and the broken. Plenty, then, for the 51-year-old to get his teeth into. He said: “I think it probably portrays real life. Private eyes are probably quite isolated people because it doesn’t help the job they do to live in a lovely warm environment. His main demon is alcohol. Ken Bruen’s brother died of alcoholism, so he knows what he is talking about and he doesn’t sell you short. “He is pretty searing in his portrayal of that. As long as it is connected to the story I don’t mind going to those very dark places. The actor is no stranger to pushing the envelope for his art, be it his intense performance as Barlinnie prisoner poet Larry Winters in Silent Scream, for which he won the Silver Bear award for best actor at the Berlin International Film Festival in 1990. He also appeared naked on stage with Nicole Kidman in The Blue Room. More recently, however, he’s become a fixture of prime-time TV entertainment, be it guesting in BBC1’s Ripper Street, as Sir Richard Carlyle in ITV smash Downton Abbey, as exiled knight Ser Jorah Mormont in fantasy drama Game of Thrones, or playing a married inmate in BBC1’s Prisoner’s Wives. He said: “It’s a funny one. I don’t think I had done a repeat TV in my life up until a couple of years ago. I just happened to land in a couple of TV series that were popular, which was a treat. “It’s a curious thing. Some of the work I am most proud of is my film work, which invariably nobody sees because it is more arty. It is nice to be in stuff that is being seen. “When you accept something like Game of Thrones, you have no idea if this is going to be a disaster and die after the first year or if you are just going to do the pilot. He hasn’t done a bad job of guessing right. His career is an enviable one that has included acclaimed stage productions. He is currently working on William Boyd’s Longing – an adaptation of Anton Checkov short stories – alongside Tamsin Greig and John Sessions. Jack Taylor, which starts this week on Channel 5, reunites him with director Stuart Orme. Former Aberdeen University student Glen worked with him in his first big breakthrough role – as a gangster in 1988 drama The Fear – after leaving the Royal Academy of Dramatic Art in London. It has given him cause to reflect. He said: “That was my first role out of drama school and it is lovely to be reunited with him. When I left Rada and started work, I got into a good position fairly quickly. The same cannot be said for the people Jack Taylor deals with. The opening episode, The Guards, finds him turfed out of the Irish police, being asked to find a missing daughter and then uncovering Galway’s seedy underbelly when four girls’ bodies turn up. He said: “We’ll see how it goes but I love playing the role, I love getting the scripts through. “It’s familiar but I think it is familiar with twists.